All business owners know that companies can’t survive with consistent and steady sales. Keeping track of multiple accounts, their progress and status can become an enormous hassle. 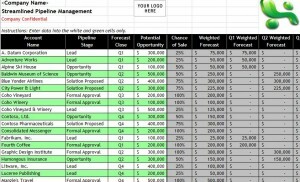 A detailed sales pipeline funnel management template is an excellent tool for keeping track of ongoing leads and potential sales opportunities. The template will nearly instantly free up more time for meeting with clients or other business-related activities. The template is instantly downloadable, available right here and it’s completely free. Business owners will easily fall in love with the streamlined pipeline template. There are two worksheets included in the template: the Pipeline Details sheet and the Pipeline Chart sheet. The top of the Pipeline Details spreadsheet is reserved for your company’s name, address, phone number and logo. You can also add the color scheme of the business or company if you so choose. Ten different categories appear in the heart spreadsheet: Account Name, Pipeline Stage, Forecast Close, Potential Opportunity, Chance of Sale, Weighted Forecast, Q1 Weighted Forecast, Q2 Weighted Forecast, Q3 Weighted Forecast and Q4 Weighted Forecast. Formal Approval – 100% Chance of a Sale. The bottom of the first sheet is reserved for all the financial totals, which will be calculated automatically if the information is properly input. As designed, you will only put financial and business information in the green and white areas. Miscalculations, incorrect financial figures and information may be reflected in the template if the info is placed in the wrong areas. 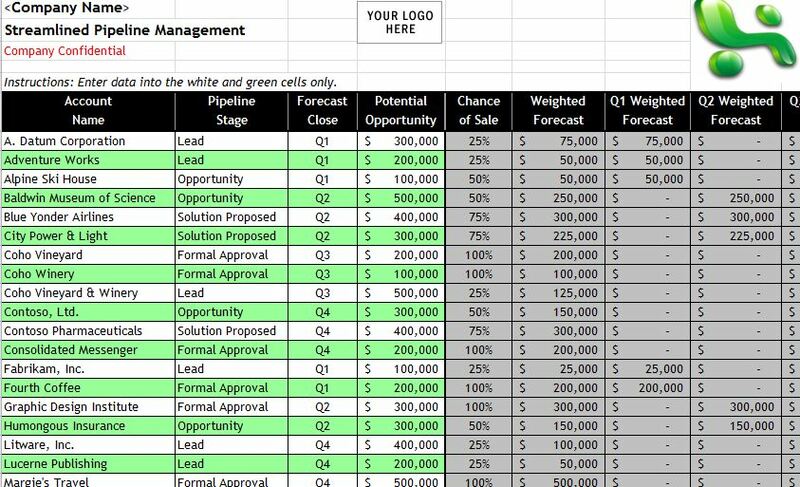 The Pipeline Chart spreadsheet serves as a tracking chart for the accounts. The totals at the bottom are broken down by quarterly and cumulative totals. The tracking chart is completely customizable and can be altered to whatever will best suit your needs.